This article returns to an issue addressed here six years ago—in The Editors, “Working-Class Households and the Burden of Debt,” Monthly Review, May 2000. It represents an attempt to update and extend that earlier analysis. Although the tables below are similar to those in the earlier article, some changes have been made in the presentation of the data due to alterations in government statistical sources. It is an inescapable truth of the capitalist economy that the uneven, class-based distribution of income is a determining factor of consumption and investment. How much is spent on consumption goods depends on the income of the working class. Workers necessarily spend all or almost all of their income on consumption. Thus for households in the bottom 60 percent of the income distribution in the United States, average personal consumption expenditures equaled or exceeded average pre-tax income in 2003; while the fifth of the population just above them used up five-sixths of their pre-tax income (most of the rest no doubt taken up by taxes) on consumption.1 In contrast, those high up on the income pyramid—the capitalist class and their relatively well-to-do hangers-on—spend a much smaller percentage of their income on personal consumption. The overwhelming proportion of the income of capitalists (which at this level has to be extended to include unrealized capital gains) is devoted to investment. Nevertheless, rather than declining as a result, overall consumption has continued to climb. Indeed, U.S. economic growth is ever more dependent on what appears at first glance to be unstoppable increases in consumption. Between 1994 and 2004 consumption grew faster than national income, with the share of personal consumption expenditures in GDP rising from 67 to 70 percent.4 How is this paradox—declining real wages and soaring consumption—to be explained? But if this [stagnating wages] is the case, where is all of the consumption coming from? Has capital managed somehow to square the circle—to increase consumption rapidly while simultaneously holding down wages? The obvious answer—or a good part of it—is that in a period of stagnant wages, working people are increasingly living beyond their means by borrowing in order to make ends meet (or, in some cases, in a desperate attempt to inch up their living standards). To a considerable extent, the current economic expansion has been bought on consumer debt. If this was the case six years ago just before the last economic downturn, it is even more so today and the potential consequences are worse. Since consumption expenditures have been rising in the United States much faster than income the result has been a rise in the ratio of overall consumer debt to disposable income. As shown in, the ratio of outstanding consumer debt to consumer disposable income has more than doubled over the last three decades from 62 percent in 1975 to 127 percent in 2005. This is partly made possible by historically low interest rates, which have made it easier to service the debt in recent years (although interest rates are now rising). Hence, a better indication of the actual financial impact of the debt on households is provided by the debt service ratio—consumer debt service payments to consumer disposable income. Chart 1 shows the rapid increase in the debt service ratio during the quarter-century from 1980 to the present, with a sharp upturn beginning in the mid-1990s and continuing with only slight interruptions ever since. Aggregate data of this kind, however, does not tell us much about the impact of such debt on various income groups (classes). For information on that it is necessary to turn to the Federal Reserve Board’s Survey of Consumer Finances, which is carried out every three years. 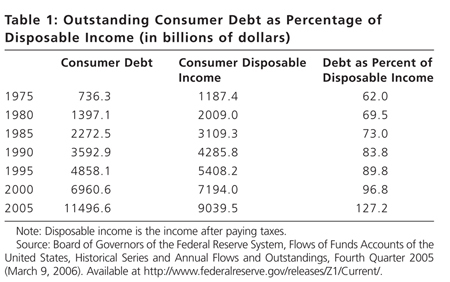 Table 2 provides data on what is known as the “family debt burden” (debt service payments as a percentage of disposable income) by income percentiles. Although the family debt burden fell for almost all levels of income during the most recent recession (marked by the 2001 survey) it has risen sharply during the latest sluggish expansion. For those families in the median-income percentiles (40.0–59.9), debt burdens have now reached their peak levels for the entire period 1995–2004. These families have seen their debt service payments as a percentage of disposable income increase by about 4 percentage points since 1995, to almost 20 percent—higher than any other income group. The lowest debt burden is naturally to be found in those in the highest (90–100) income percentiles, where it drops to less than 10 percent of disposable income. All of this points to the class nature of the distribution of household debt. This is even more obvious when one looks at those indebted families who carry exceptionally high debt burdens and those that are more than sixty days past due in their debt service payments. 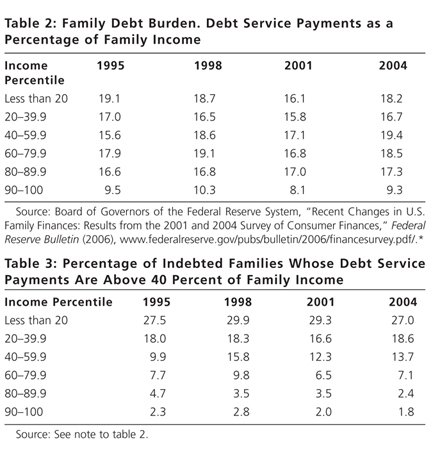 Table 3 shows the percentage of indebted families by income percentiles that have family debt burdens above 40 percent. Such financial distress is inversely correlated with income. More than a quarter of the poorest indebted families—those in the lowest fifth of all families—are carrying such heavy debt burdens. Families in the next two-fifths above that, i.e., in the 20.0–59.9 income percentiles, have experienced increases in the percentage of indebted families carrying such excessive debt burdens since 1995—with the number of indebted families caught in this debt trap rising to around 19 percent in the second lowest quintile, and to around 14 percent even in the middle quintile. In contrast, for those in the 40 percent of families with the highest incomes, the percentage of households experiencing such financial distress has diminished since 1995. Thus with the rapid rise in outstanding debt to disposable income, financial distress is ever more solidly based in lower-income, working-class families. Table 4 shows the percentage of indebted families in each income category that are sixty days or more past due on any debt service payment. For families below the 80th percentile in income the percentage of indebted families falling into this category has grown sharply since 1995. In contrast families in the 80th percentile and above have seen a drop in the percentage of indebted families that are overdue on a debt payment. Again, we see that the growth of financial distress in the United States today is centered on working-class households. The typical family is also mired in credit card debt. At present nearly two-thirds of all cardholders carry balances and pay finance fees each month—with the average debt balance per cardholder rising to $4,956 at the end of 2005. In recent years, there has been a shift from fixed to variable rate cards, as interest rates have begun to rise, with about two-thirds of all credit cards now carrying variable rates—up from a little more than half a year ago. Interest rates on cards are rising rapidly—what the Wall Street Journal has called “The Credit-Card Catapult” (March 25, 2006). In February 2006 the average interest rate for variable-rate cards jumped to 15.8 percent from 12.8 percent for all of 2005. Meanwhile, the portion of credit card-issuer profits represented by fees went up from 28 percent in 2000 to an estimated 39 percent in 2004. Altogether unpaid credit card balances at the end of 2005 amounted to a total of $838 billion.9 The effects of this fall most heavily on working-class and middle-income families. According to the Survey of Consumer Finances, the percentage of households carrying credit card balances rises with income up until the 90th income percentile, and then drops precipitously. In this general context of rising household debt, it is of course the rapid increase in home-secured borrowing that is of the greatest macroeconomic significance, and that has allowed this system of debt expansion to balloon so rapidly. Homeowners are increasingly withdrawing equity from their homes to meet their spending needs and pay off credit card balances. As a result, “in the October to December  period, the volume of new net home mortgage borrowing rose by $1.11 trillion, bringing the level of outstanding mortgage debt to $8.66 trillion—an amount that equaled 69.4 percent of U.S. GDP.”13 The fact that this is happening at a time of growing inequality of income and wealth and stagnant or declining real wages and real income for most people leaves little doubt that it is driven to a considerable extent by need as families try to maintain their living standards. The surprising strength of consumption expenditures, rising faster than disposable income, has most often been attributed to the stock market wealth effect (the notion that the equivalent of a couple of percentages of increases in stock market wealth go to enhanced consumption expenditures by the rich—those who mostly own the nation’s stocks).15 Pomboy argues, however, that “there is evidence to suggest that the housing wealth effect may be significantly larger than the stock market wealth effect….Based on a recent study by Robert Schiller (of ‘Irrational Exuberance’ fame) housing has always been a more important driver for consumers than the stock market. In his rigorous state by state and 14 country analysis, he found housing to have twice the correlation with consumption than the stock market has.” For Pomboy, this suggested that the writing was on the wall: “With homeowners’ equity near all-time lows, any softening in home prices could engender the risk of a cascade into negative equity. But even more immediately, the increase in mortgage debt service (again, despite new lows in mortgage rates) does not bode well for consumption as the Fed prepares to reverse course”—and raise interest rates. The decrease in home equity and the increase in mortgage debt service (and the debt service ratio as a whole) suggest how great the “speculative fervor” underpinning consumption growth actually is today. The housing bubble and the strength of consumption in the economy are connected to what might be termed the “household debt bubble,” which could easily burst as a result of rising interest rates and the stagnation or decline of housing prices. Indeed, the median price of a new home has declined for four straight months at the time of this writing, with sales of new single-family homes dropping by 10.5 percent in February, the biggest decline in almost a decade, possibly signaling a bursting of the housing bubble. The truth is that without a step-up in business investment the U.S. economy will stagnate—a reality that speculative bubbles can hold off and disguise in various ways, though not entirely overcome. But investment is blocked by overaccumulation and overcapacity. Hence, the likely result is continued slow growth, the further piling up of debt, and the potential for financial meltdowns. There is no growth miracle whereby a mature capitalist economy prone to high exploitation and vanishing investment opportunities (and unable to expand net exports to the rest of the world) can continue to grow rapidly—other than through the action of bubbles that only threaten to burst in the end. The tragedy of the U.S. economy is not one of excess consumption but of the ruthless pursuit of wealth by a few at the cost of the population as a whole. In the end the only answer lies in a truly revolutionary reconstruction of the entire society. Such a radical reconstruction is obviously not on the table right now. Still, it is time for a renewed class struggle from below—not only to point the way to an eventual new system, but also, more immediately, to protect workers from the worst failures of the old. There is no question where such a struggle must begin: labor must rise from its ashes. ↩ See U.S. Department of Labor, Bureau of Labor Statistics, Consumer Expenditures in 2003, June 2005, table 1, http://www.bls.gov/cex/. ↩ Clark quoted in Paul M. Sweezy, The Theory of Capitalist Development (New York: Monthly Review Press, 1970), 168–69. ↩ “Economy Up, People Down,” August 31, 2005, and “Real Compensation Down as Wage Squeeze Continues,” January 31, 2006, Economic Policy Institute, http://www.epi.org. ↩ The shares of investment, government, and exports remained the same in 1994 and 2004 at 16, 19, and 10 percent, respectively, while the share of imports (subtracted from GDP) went from –12 to –15 percent. U.S. Department of Labor, Bureau of Labor Statistics, Occupational Outlook Quarterly 49, no. 4 (Winter 2005–06): 42, hhttp://www.bls.gov/opub/ooq/2005/winter/contents.htm/. ↩ Kevin Phillips, American Theocracy (New York: Viking, 2006), 324–25. ↩ “Recent Changes in U.S. Family Finances” (see note to table 2 in this article), A28–A29. ↩ “Household Financial Indicators,” Board of Governors, Federal Reserve System, Flow of Funds, 2006. ↩ Doug Henwood, “Leaking Bubble,” The Nation, March 27, 2006. ↩ “The Credit-Cart Catapult,” Wall Street Journal, March 25, 2006; Phillips, American Theocracy, 327. 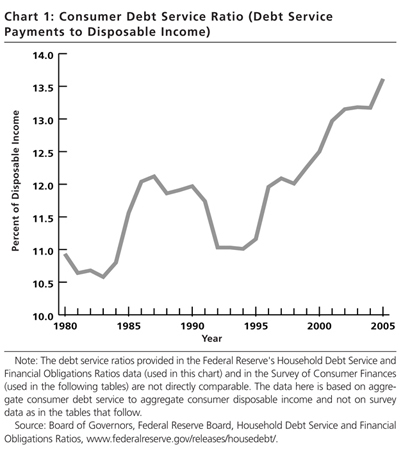 ↩ “Recent Changes in U.S. Family Finances” (see note to table 2 in this article), A28. ↩ The Center for Responsible Lending and the Consumer Federation of America, Car Title Lending (April 14, 2005), http://www.responsiblelending.org. ↩ “As Debt Collectors Multiply, So Do Consumer Complaints,” Washington Post, July 28, 2005. ↩ “Household Financial Conditions: Q4 2005,” Financial Markets Center, March 19, 2006, http://www.fmcenter.org. ↩ Stephanie Pomboy, “The Great Bubble Transfer,” MacroMavens, April 3, 2002, http://www.macromavens.com/reports/the_great_bubble_transfer.pdf. ↩ See for example the treatment of this in Council of Economic Advisors, The Economic Report of the President, 2006, 29–30, http://www.gpoaccess.gov/eop/. ↩ Stephanie Pomboy, “Handling the Truth,” Barron’s, February 7, 2005, Barrons Interview; “Wal-Mart Fishes Upstream,” Business Week Online, March 24, 2006. ↩ Pomboy, “Handling the Truth” “Too Much Cash,” Barron’s, November 7, 2005. See also “Long on Cash, Short on Ideas,” New York Times, December 5, 2004.